Before buying our View, my husband and I thought about how we could configure three car seats for all of our children in an r.v. We were very happy to read that the View had four seat belts in the dinette, which were actually bolted down to the floor for safety. Because of this feature, we would be able to safely install all of our seats. The Winnebago View also has anchor points behind the seats for car seat tethers. It was very difficult for us to find information on car seat installations and even seat belt locations, without physically inspecting them, so I decided to show you how we chose to install our seats. Keep in mind, each state has its own safety laws, so make sure you check what the laws are for your state (or the state you are driving in). This is what we have chosen to do for our children's safety, we are offering this information for anyone who is interested, but in no way telling you what to do for your kiddos. If you'd like professional help, you can ask your local police or fire station for help with your installs. They should have certified car seat technicians available and willing to help! 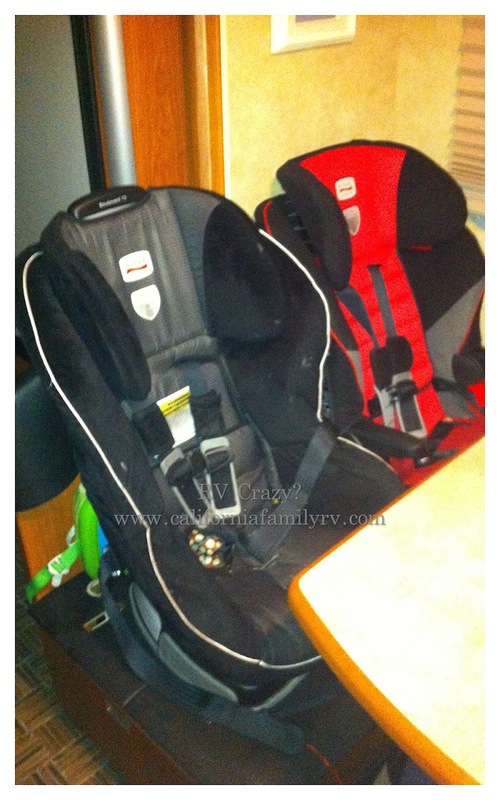 When we first got the r.v., we just placed the car seats in the dinette area to get an idea of how they would be set up. They fit well (we had measured them all prior to buying), but we were both concerned about the possibility of the seats bouncing around due to the thick, plush cushions used on the dinette. A larger concern was the seat belts, which were not locking belts like we were used to. Lap belts are great, but they just don't cinch tightly enough for our comfort. First, we removed the cushions. By placing the seats directly on the wood, we would increase the proximity of the seats to the latches, making a much tighter fit. Because I was concerned about the seats marking up the wood, I purchased some rubber mats (sold at Anna's Linens for $12 each, listed as play mats) and cut them to size. They were simply to protect the r.v. wood behind and under the car seats. Then, we looked at the mechanics under the seats, and we liked what we saw! We were able to replace the lap belts with seat belt extenders (which came with each of our car seats). You can also purchase these online for about $13, or call your car seat manufacturer to purchase the exact ones for your seats. 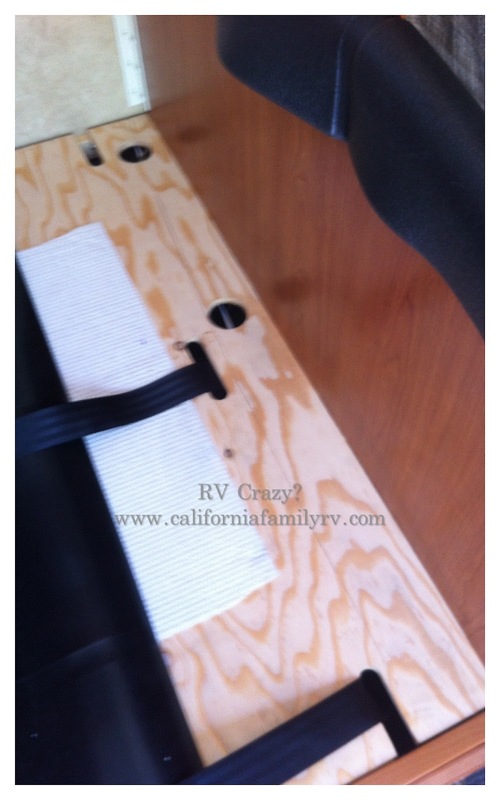 The latch system works with these straps, and each latch will attach to one strap which is then bolted to the floor of the r.v. We used a hole-saw to drill holes for the car seat extender straps to come through (see round holes on top left). We left one lap belt in place in case an adult is sitting at the dinette with the kids. Lap belts removed, and car seat extenders are bolted in their place. Dinette seat with holes drilled, and rubber mat in place. Just to make installs easy each time, I used elastic to tie the seat belt extenders up on either side of the hole. This way, the straps are within very easy reach to the latches each time. 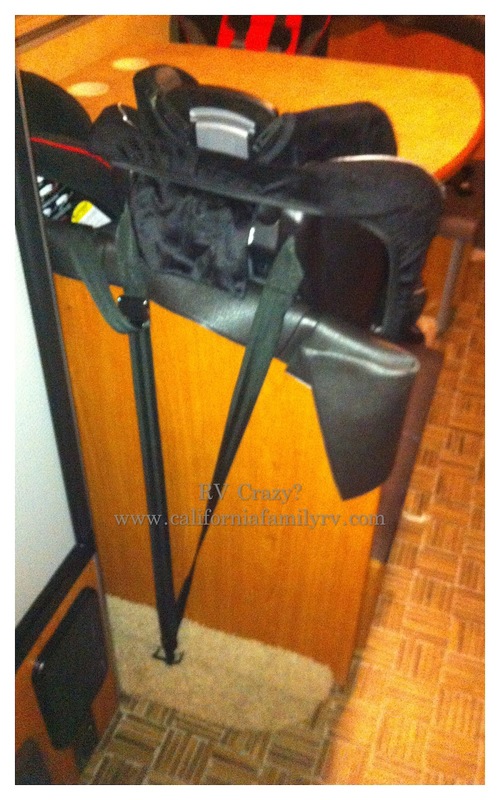 If you don't do this, you will have to fish for the strap each time you go to install the seat, which is a real pain! This step is just for ease of use, it doesn't improve safety in any way. I used elastic, because there is ample storage under these seats, which we still wanted to utilize. With the elastic, you can still easily lift the plywood up and down (sort of like a hinge) to place things under the seats. Here's our other dinette seat and rubber mats. This side houses two car seats, so we have only latches on this side. Helpful hint: BEFORE latching the seats in, loosen the latch strap a lot! It's much easier to quickly tighten it, than to try to loosen it once the seat is in place. Also, when latching the seat, push the latch button in, then attach to the seat extender strap, then release the latch button. I always tug on the latch several times just to make sure it's fully latched. A few extra minutes to really make sure those seats are in tightly, is well worth the alternative. Two (dirty-sorry, but it's real life here people!) car seats installed with their latches.This gives a nice, super tight fit. The seats do not move at all, when latched tightly in place like this. Helpful hint: When tightening your latches, pull the strap back through the seat's opening in the cushion (instead of around the outside of the seat) put your knee in the seat and pull as hard as you can. You can get it much tighter this way! Finally, we can tether the seat to it's anchor on the floor below. Tight as can be! Since our "baby" L sleeps on this dinette bed each night, it is a bit of a pain to remove & re-install the car seats when we drive anywhere on the trips. But our kids won't be young for long, and it is worth it (in our opinion) to have them safe and secure while we travel. We have a pretty good system now for removing and installing the seats, so it goes pretty quickly. Once we are settled in a campsite, we store the car seats on the driver & passenger seats so they are up and out of our way. Works great for us! Hope this has helped for those of you with little kids, or helped made those of you without little kids grateful to not have to deal with this extra hassle. hee hee. Hi there, thanks for all of the great info! 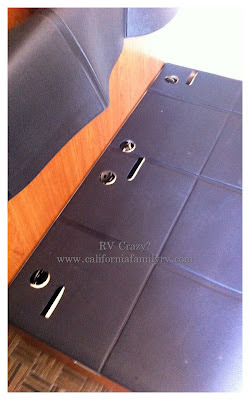 I am trying to find seat belt extenders that would work, the RV we are considering purchasing is very similar to yours where you show the lap belts being bolted to the floor of the RV around the inside framing of the dinette seating. The best thing I have been able to come up with so far is http://www.seatbeltextenderpros.com/bolt-in-car-seat-belt-extender/ -- is this anything like what you are using? Could you possibly describe in a bit more detail exactly what you did with the lap belts (e.g., you removed the lap belts, installed the seat belt extenders, bolting those to the floor, then put the old lap belts on the end of the seat belt extender?) Thanks again! 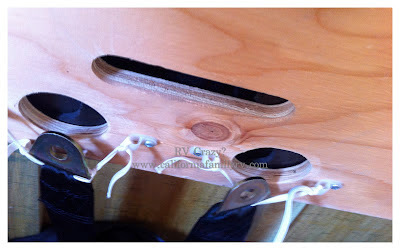 I couldn't figure out how to add a photo to this comment, but I added a close-up in the blog post showing the latch attached to the seat belt extender. I hope this helps. Hi ctrace. Glad it was helpful for you. Those look very much like the seat belt extenders that we are using. We removed the lap belts completely in the seats we use for our carseats. After one end of the extender is bolted to the floor (where the lapbelts used to be bolted), we used the other end of the seat belt extender to attach our carseat latches to. Again, I'm not a safety expert, but after looking at our options, we felt this is the safest option for our seats. They are latched in tightly, and don't wiggle around at all. Then we attach the tether to the anchors behind the dinette seat. Hope this helps. If you have further questions, feel free to comment or email and I'll be happy to help. :) Good luck, and happy rv'ing! Hi, I appreciate your article too! Looking to head out a trip with my 3 older kids- 12, 13 and 17, and with my sister who has 2 much younger kids, who will be 3, and 10 months when we head out - our parents are coming as well. My question to you is, we have only found 1 single model of RV, available at the only dealer anywhere near us, that can seat 9 people as we need it to. And there is only 1 of the floor anchors forcar seats, in this model, and it is located behind one of the booth at the dinette- facing forward. Of course both the 3 year old and 10 month old need to be in car seats, 1 forward facing, and one rear facing. My sister an I have Never tried to use anchors that are in the floor (just the ones on her sedan; the the crease of the car aeat ). So my question really is, can 2 car seats be hooking into that 1 floor tether/anchor together?? ; We have asked, but being as we are renting the RV, they will not agree to installing a second tether/anchor. Hi Megan. It can be so frustrating to try and find the right seating configuration to keep everyone safe, can't it?! 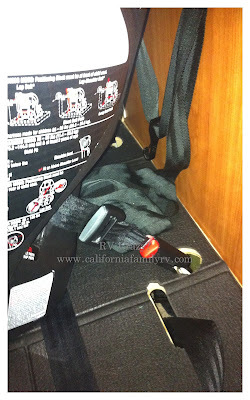 The anchors on the floor are for the long tether strap that is usually attached to the back of each car seat. They are not the same as the latch system that most of us use to connect the car seats in our car. For example, we use the latch system (in the crease of our seats) and then also attach the car seat tether to the anchor at the bottom. It's like a double safety net. So, I'm thinking that you will be using the rv seat belts to strap your sister's car seats into the vehicle, then tether the forward facing carseat to the one anchor in that rv. Depending on the type of seat her rear-facing car seat is, she may not be able to use the floor anchor tether on that one anyway. The following link shows some diagrams that I found very helpful. The "Car Seat Lady" says not to install two seats on one anchor tether, but as with all things, you will have to do your research and make the decision you are most comfortable with. Are you able to take the car seats to the rv dealer and try to see how they fit in the rv you'll be renting? I know it's a pain, but it can really help to see how it will all fit together. I hope it works out for you guys. I LOVE traveling with my sister. Happy travels! 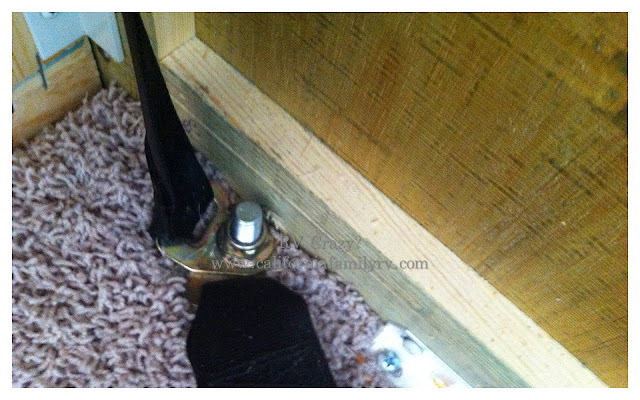 I am not sure if you are still watching this post but i was wondering how many floor tether anchors your View came with and their locations. Also, I was surprised to read your View had four seat belts around the table, I have only ever seen three. What year is your RV? Hi! We have 2 (one behind each dinette bench). And yes our dinette had 4 seat belts in it. It's a 2008 Winnebago View (on a 2007 Sprinter Chassis). Good luck. 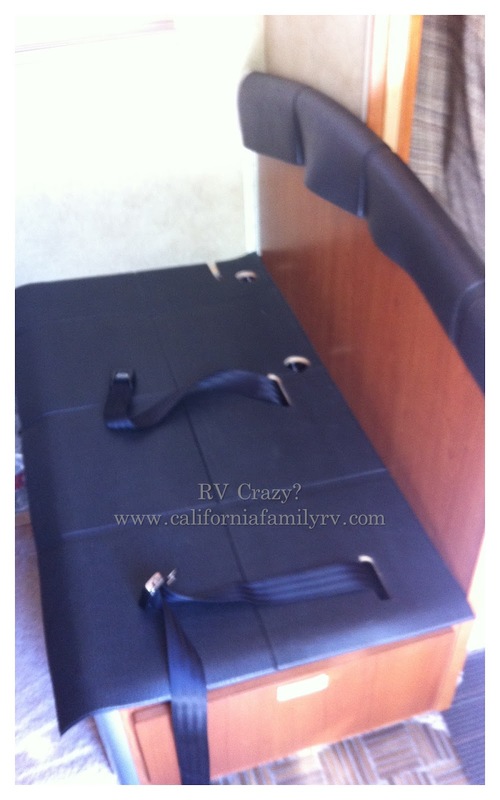 I wish the manufacturers would be a little more innovative with seat belts for kids in these RV's. 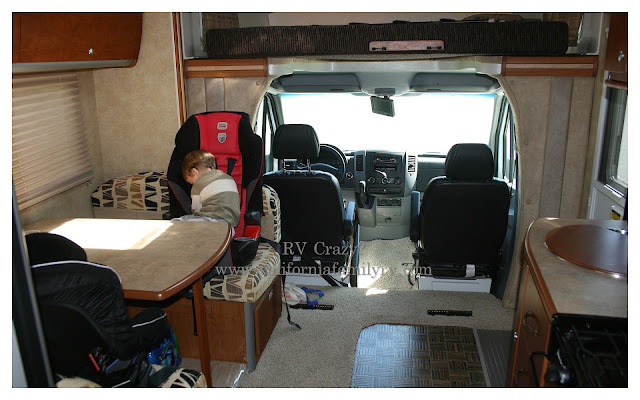 Maybe with a younger crop of RV'ers and more RV'ers traveling with grandkids, they will start to change. Happy Travels!